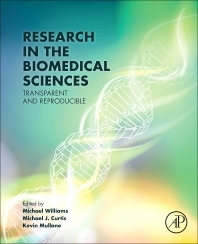 Research in the Biomedical Sciences: Transparent and Reproducible documents the widespread concerns related to reproducibility in biomedical research and provides a best practices guide to effective and transparent hypothesis generation, experimental design, reagent standardization (including validation and authentication), statistical analysis, and data reporting. The book addresses issues in the perceived value of the existing peer review process and calls for the need for improved transparency in data reporting. It reflects new guidelines for publication that include manuscript checklists, replication/reproducibility initiatives, and the potential consequences for the biomedical research community and societal health and well-being if training, mentoring, and funding of new generations of researchers and incentives for publications are not improved. This book offers real world examples, insights, and solutions to provide a thought-provoking and timely resource for all those learning about, or engaged in, performing and supervising research across the biomedical sciences.